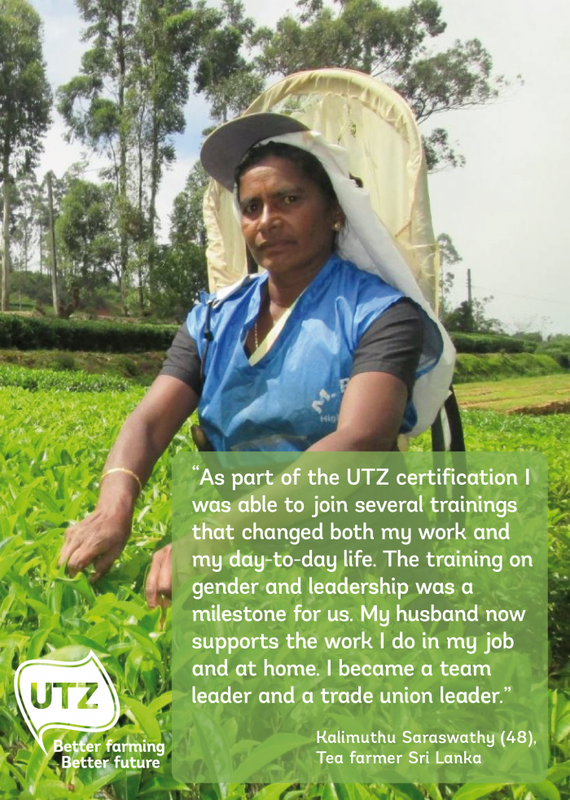 I have met many women doing extraordinary things since I started working in the cocoa sector ten years ago. This International Women’s Day I want to celebrate them, and also take time out to recognize how far we have come in the last few years – and how far we still have to go. Most of the chocolate you and I eat is made from cocoa grown by farmers such as Léonie Osso Sona, who lives in Côte d’Ivoire in West Africa. Léonie is amazing – she’s feisty, independent and a born leader. The world needs more strong women like her. She’s right, of course. Quite often, when women are offered the same opportunities as men, the changes they make really are remarkable. That’s because women tend to plough most of the extra money they make back into their home and family, meaning increased investment in the education of their children, family health and nutrition. They play a key role in creating stronger, healthier and more sustainable communities. And it doesn’t take much to bring about change. Léonie is now president of the Offa village women’s farmer association, and has even won a prize for her increased cocoa production. Léonie is now president of the Offa village women’s farmer association, and has even won a prize – brilliantly known as ‘The Woman With The Large Hat’ prize – for her increased cocoa production. All this came about because of her drive, and because she was empowered with knowledge and tools. Not much in the grand scheme of things – but Léonie grabbed her chance and made the most of it. Côte d’Ivoire produces around a third of the world’s total cocoa supply. There are about 800,000 cocoa farmers in the country, the majority of them farming on small plots and trying to survive on a tiny income. But while male cocoa farmers have always had the right to own the land they work, women usually didn’t. A mixture of culture and tradition also meant that until recently when a woman was widowed, for example, the land would go to another male member of the family such as a brother, instead of to her. In fact, while women contribute to almost 50% of the work across West Africa, they only own about a quarter of the land. On top of this, women can usually only access lower paid jobs. 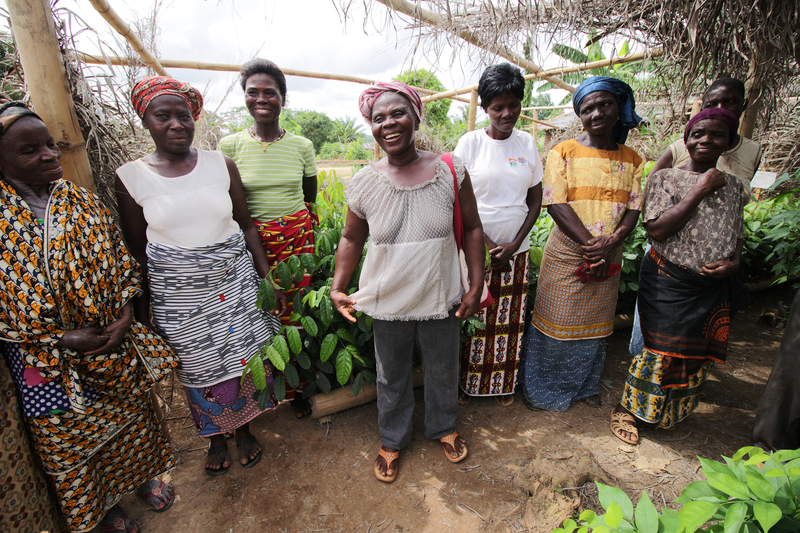 In the cocoa sector, women are usually involved in early crop care and post-harvest activities that determine the quality of the beans. But most of the training in how to grow and treat those beans were traditionally claimed by men and many women were left to farm with little training – though this is changing. There is more good news. I’m really pleased to see that more and more companies in the cocoa supply chain see the need to invest in women, and have developed specific programs or projects focused on their empowerment. 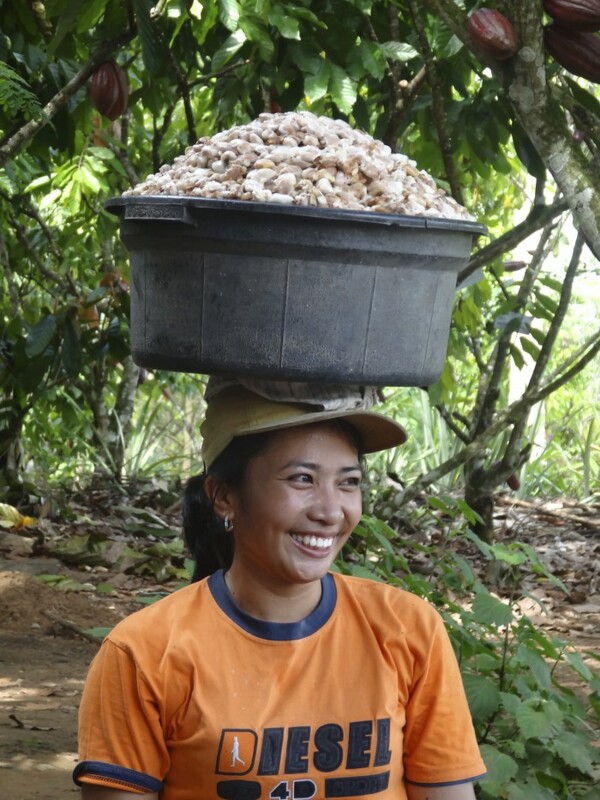 For instance, the World Cocoa Foundation’s Cocoa Action, signed by some of the biggest names in the industry – including Mars, Ferrero, Nestle and Cargill – includes a commitment to promote gender equality. When it comes to sustainability, it is important to work in a holistic way, involving families, communities, cooperatives and companies in order to create the conditions for change to happen. Men as well as women need to become aware of the fact that more gender equality is a human right, and leads to better life conditions for the whole family and the whole community. When it comes to sustainability, it is important to work in a holistic way, involving families, communities, cooperatives and companies in order to create the conditions for change to happen. Governments, companies and (local) organizations can all play a vital part, through offering training in self-awareness and leadership, awareness raising in communities, and supporting women to access economic activities and savings schemes. As Léonie proves, it doesn’t take much to light the spark and spread the word among both women and men that things can be different – and better. That’s why we need to promote the strengthening of women’s leadership and help producer organizations become more inclusive, and address the needs and interests of men and women. We also need to see more initiatives such as the newborn Women in Cocoa and Chocolate (WINCC) Network, which brings women from the cocoa sector together to learn from each other, and the Global Conference on Women in Cocoa (organized by the World Cocoa Foundation) where women share experiences and help to empower each other. My own vision is a world where sustainable farming is the norm, and my organization has taken steps on the path to more gender equality and women’s empowerment. Our code of conduct, for instance, requires that women have equal opportunities to attend training, and that every cocoa farmer group appoints someone responsible for equal rights and opportunities for women. Our code of conduct requires that women have equal opportunities to attend training, and that every cocoa farmer group appoints someone responsible for equal rights and opportunities for women. But there is still an incredibly long way to go. We must all help to ensure that the world encourages more strong women such as Léonie, and that women farmers in Côte d’Ivoire and beyond get access to better opportunities in the future. If we all do that, by this time next year there will be much more to celebrate. Note: this piece was initially published on Girl Talk HQ.